This Tuesday, Pope Francis kicked off the Jubilee Year with the symbolic opening of the Holy Doors of St. Peter’s Basilica. This year long holy celebration was designated a Jubilee of Mercy by the leader of the Catholic church. This year’s Jubilee comes nearly 15 years after the last Jubilee Year, held in 2000. The ceremonial opening of the doors has been a part of the Catholic tradition since the 1500s. Up until 1975, in fact, the Holy Doors in Rome were sealed by a cement wall that the Pope would ceremonially break down using a hammer. However on Christmas Eve of 1974, cement fragments fell too close to Pope Paul VI and the tradition was since abandoned. With safety in mind, bronze doors have replaced the wall. Catholic tradition holds that the Holy Doors symbolize Jesus who said, “I am the door” (John 10:7). The ceremony took place amid tight security, heightened law enforcement and a mandated no-fly zone. 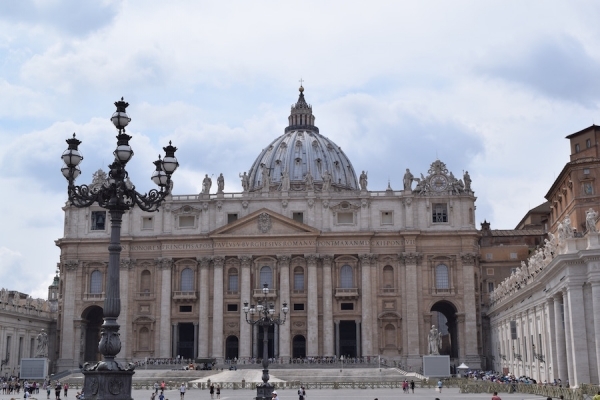 Over 50,000 people were present for the holy act, including Italian President Sergio Mattarella, Prime Minister Matteo Renzi, and members of the Belgian royal family. Perhaps the most distinguished guest of honor was Francis’s predecessor, Pope Emeritus Benedict XVI, who followed him through the Holy Doors. Assisted by a cane and a longtime aide, the retired Pope has made very few public appearances since his resignation in 2013. Tuesday’s ceremony in Rome marked the beginning of a very important period for Catholics. The Jubilee Year of Mercy offers a time for sinners to repent. Many believe that one receives an indulgence or pardon by walking through the Holy Doors. Under the year’s theme of mercy, Pope Francis has urged the Church to be more forgiving and understanding of its parishioners. He has even gone so far to declare that during the Jubilee Year of Mercy, priests can absolve women who have had abortions. "Salvation is offered to every human, to every people, without exception, to each of us," Pope Francis said during the ceremony, "None of us can say, 'I am holy, I am perfect, I am already saved." This year’s Jubilee will bring hoards of pilgrims to the Holy City. Now more than ever, we urge travelers to plan their visits to Rome well in advance.